Welcome & thanks for reading our Newsletter! February's been an ultra-busy month for us but even as I write, things have finally settled down from a very successful trip to Hampton, VA for the Mid-Atlantic Quilt Show! So if you're thinking it's about time for us to be starting on a new design, you are RIGHT! Several ideas have been percolating in my head for a few weeks now, so be on the lookout very soon for the start of another Purse Pattern Chronicles series on our Blog... the 17th such series to be exact! Can you believe it? So... go ahead and get started on the Newsletter. We have some fun things in store for you this month including a newly retired pattern! Her incredibly 'joyful' Triple Play was the winner of our February 2018 Handbag of the Month! Her prize? ... a $25 virtual gift certificate and a permanent place of honor in our "Handbag of the Month Archive"! Click HERE to see a photo of Patti's beautiful winning bag, but in the meantime, it's time to reset for will sadly be our LAST Handbag of the Month contest! I'll share more about why I feel it's time to move forward with a new format in a future blogpost but in the meantime.... whenever you're ready, scroll down to check out this month's stunning entries, then vote for your favorite. So let’s kick this last contest off with this remarkable Flaptastic Bag created by Denise Camire of Nashua, NH. Denise said she used her favorite colors and made this bag for the summertime! I totally love the very graphic print that Diane Jones-Straus chose for her Odyssey! It made my day when she stopped by my booth at Road2CA to show me this gorgeous bag. This warm & “wooly” Bellagio Bag was created by Celia Ann Oliver of Colgrave, UK and you guessed it… she fashioned this bag in wool which strikes me as quite difficult, but what a lovely result, no? And I first spied this Everyday Attache on our FaceBook Group page & immediately recognized how ultra-special it was! This beauty was created by Karen Longnecker of LaMonte, MO. Here's a peek at the INSIDE! This fussy-cut Everyday Attache also appeared first on our FaceBook Group page. Paula Faes of Santa Maria, CA is the creative mind behind this amazing bag! Here's a look at the exterior! And Gail Peters of Ely, MN says this is her conservative version of our Flaptastic Bag! She uses it everyday to carry a snack, her iPad & a wallet! And this “Parisian-flavored” Guardian Bag was created and submitted by Delores Kaeser of Naples, FL who is also a member of our StudioKat Designs FaceBook Group page! And lastly, this Quattro was created by Ingrid Stulp of Canada who said she just hasnt been able to find the right fabric until she met her “best friend” pictured HERE. OK, ready to vote now? We're officially retiring the Polso Pouch pattern! Wow! It sure doesn't feel like it's been thirteen years since we released the Polso Pouch pattern, but today we're sending the Polso Pouch pattern into retirement. I still love this little bag but I created it long before the advent of the smart phone and even though there are still applications where its absolutely a great choice, we have since designed small bags that more appropriately address the needs of the modern woman, (such as the Walkabout Wallet and the Go-Go Compact). So... we're sending this cutie to the retirement home but if you would still like the chance to pick up a copy (at half-price), click HERE. There is only a limited quantity of these patterns available & when they're gone.... they're GONE! It's called a "kitten train" & I'm ready to get on board! Click image or HERE for a larger view. It's not everyday you see a cat riding a horse! Just in case you missed any of our posts this past month, you can easily catch up to the rest us because they're ALL listed below! 2/16- PPC16: Our Testers Speak! The "Tech" Desk- Something even BETTER than 10000 step/day? These days it is hard to walk the streets without running into someone who is anxiously looking at their wrist to see if they are on target to reach the magic 10,000 steps. So, is it really a goal worth striving for, or might there be something better? And where did that figure come from? In order to make room for new zipper stock & styles, we still need to clear out a few "slow-moving" zippers.It's the perfect time to stock up for your Springtime projects. It's first come-first served & there is no quantity limit! ... And remember, ALL of these zips can be cut to the length YOU need! The prices are good until our stock is depleted but when they're gone... they're GONE!! Click HERE for more info! Cuddle Clones makes soft, adorable, customized stuffed-animal versions of pets! 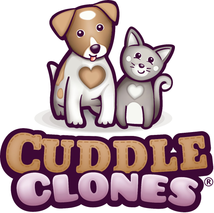 All you need do is submit a few pictures, & they'll send you your very own Cuddle Clone of your beloved pet! For more information, click HERE, & don't forget to use the coupon code STUDIOKAT to get 10% off your ENTIRE order! Interested in advertising in our newsletter? Click HERE to find out more! So... thanks for reading our newsletter! If you liked it, why not forward it to a friend? or email me some love? And if you’re seeing this newsletter for the first time, you can subscribe here to get it in your Inbox next month! So bye for now and until next month (on the 13th)!